Happy Valentine’s Day! Hearts and love are everywhere. Have you ever noticed how strawberries are perfect for the day? It’s because they are red and they have a heart shape. Plus they taste so good. Yes, those berries from Florida are spectacular. Trust me, I know. I recently was at a strawberry farm in Florida and tasted them right off the plant. Scrumptious. A farm and garden is how I was inspired to make this Herbed Strawberry Salad. Where to get those fresh strawberries in winter? Head to your local grocery store. It’s the season for Florida strawberries. Those beautiful, sweet, fresh berries from Florida Strawberry Growers Association farms can be found in the produce section. 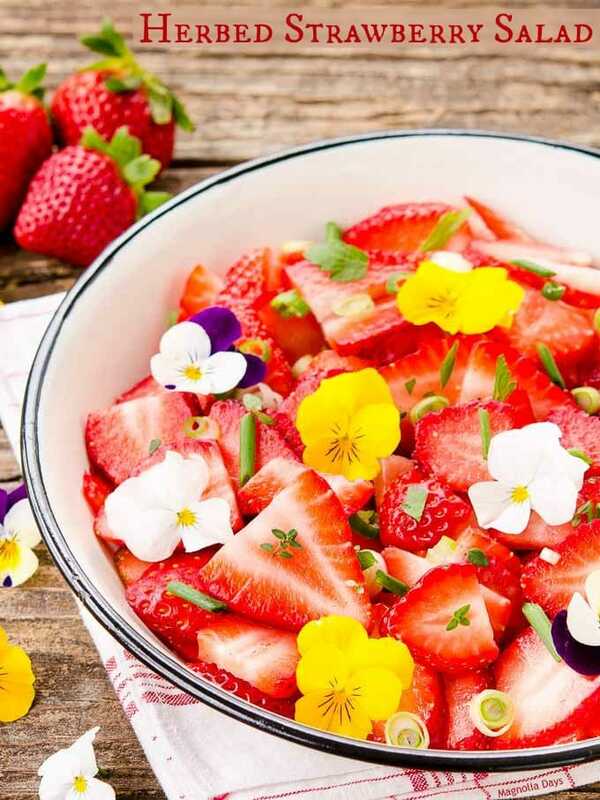 Herbed Strawberry Salad is light, healthy, and nutritious. Berries are truly in the spotlight. It’s simply sliced strawberries lightly tossed with an herb dressing and topped with more fresh herbs. Oh, and edible flowers too. One must have flowers on Valentine’s Day. I used violas because they are small and delicate. What herbs did I use? Mostly ones from my own garden. I have rosemary and used it to make an infused olive oil. Thyme is chopped and whisked into the dressing. A sprinkling of parsley is on top. Chives and green onion are also sprinkled on top. I did have to get those two from the store when I purchased the strawberries. All of the herbs should be available in the produce section of your local store. Strawberries are loaded with vital nutrients. They can help keep your body healthy and strong. It’s important to get proper nourishment especially in winter (prime cold and flu season). Only eight medium strawberries can provide the daily requirement of Vitamin C. For more strawberry nutrition information go here: 10 Reasons To Eat Strawberries. 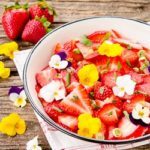 How about more strawberry recipes to make for someone special? Scroll down to find a list of them. 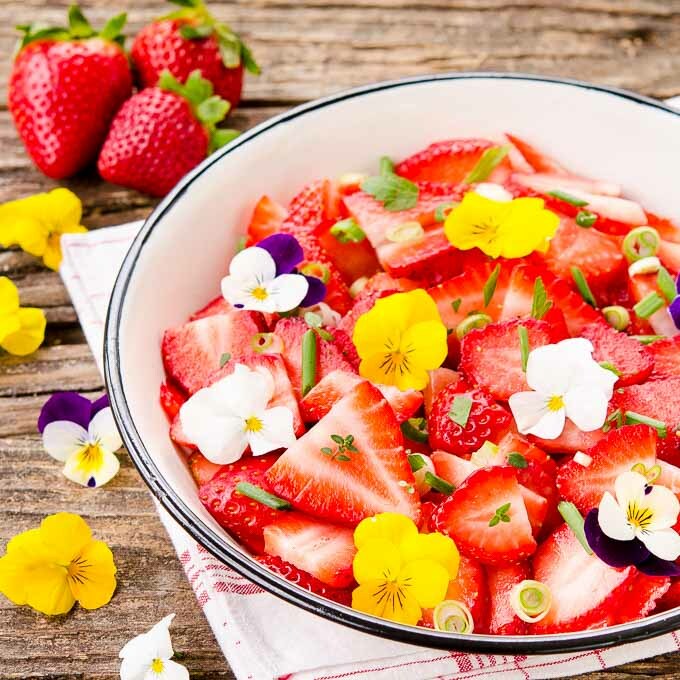 The Sunday Supper Movement is proud to partner with the Florida Strawberry Growers Association to share a delightful taste of summer all winter long. Also for festive cheers, take a look at my Strawberry Whiskey Sour and Strawberry Martini to make with those incredible Florida strawberries. For further inspiration, check out the Fresh Florida Strawberries Pinterest board. 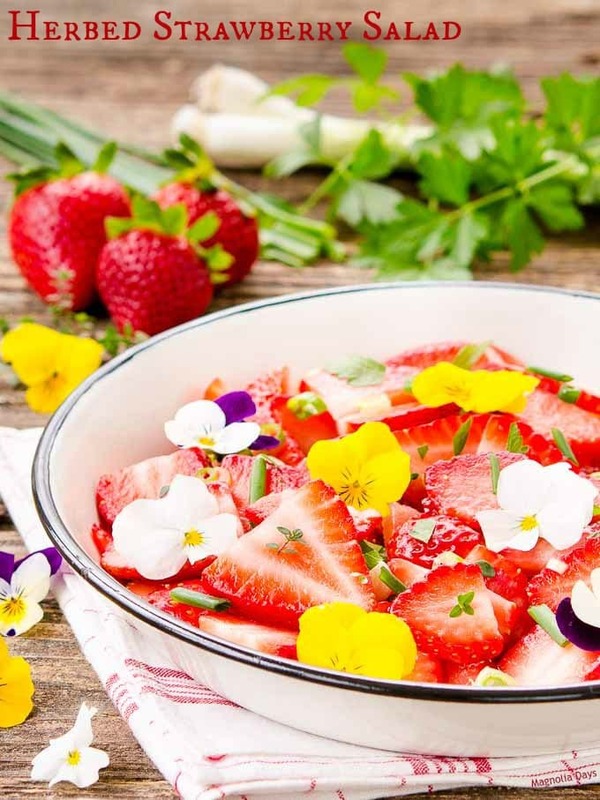 Herbed Strawberry Salad is a delightful mix of fresh strawberries, herbs, green onion, and herb dressing. It's a bowl of summer goodness. Place olive oil and rosemary in a small saucepan. Heat until warm, between 120° and 145°F. Do not allow to boil. Recipe inspired from one in the Better Homes and Gardens Special Interest Publications, Garden-fresh Recipes 2015. Wow, what a beautiful salad! This would definitely make me feel special on Valentine’s Day! Oh my gosh! The tangy dressing with sweet Florida strawberries sounds amazing! I can’t wait to make this salad! I love that you mixed herbs and strawberries. Such a nice savory/sweet combo. What a truly beautiful salad! Simple and scrumptious! I’d be going back for seconds and thirds of your lovely salad! That is one GORGEOUS salad!! That is a gorgeous salad! Love the additional of flowers to the strawberries, so pretty. Beautiful salad. I’m jealous you have fresh herbs in your garden this time of year! I love that you topped this with edible flowers! 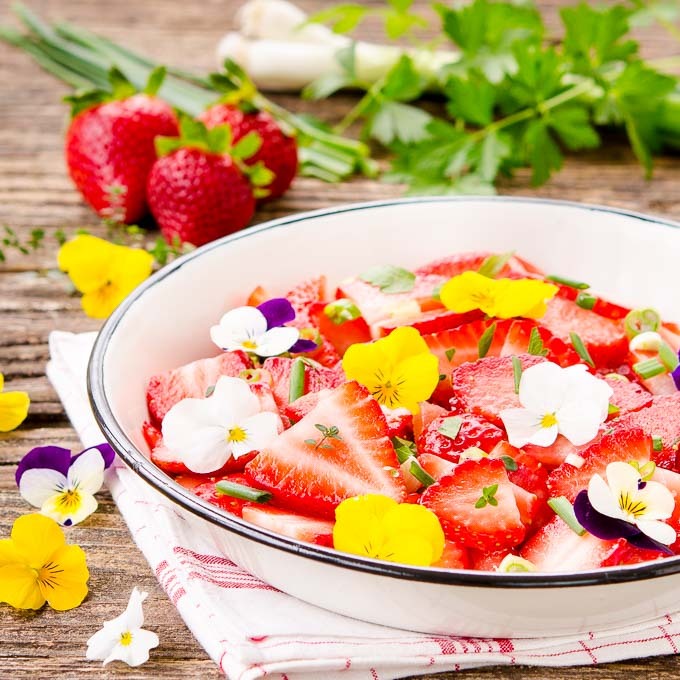 Gorgeous gorgeous salad Renee!Love everything about it, the herbs,the vibrant strawberries of course, the edible flowers and the rosemary olive oil!Your pics are making me drool!